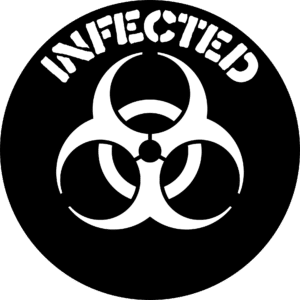 Merging the pretentions of Invasion of the Body Snatchers with a modern medical thriller, Infected showcases graphic body gore against paranoia, government level conspiracy, and a mystery plague. Dew Phillips, hardened CIA operative with a personal revenge motive, is helping to keep the bizarre new plague hush-hush while searching for a live subject. Again and again, he arrives just at the violent end, finding raving victims, tortured bodies, insanely suicidal murderers, and disturbed clues scrawled in fresh viscera. The infected themselves, after provoking death rather than capture, quickly dissolve into a strange mold while frantic CDC epidemiologist Margaret Montoya, racing against time and internal politics, attempts to find the origination of the virus and hopefully a cure. Has another country or an unknown terrorist bioengineered this plague? How have they discovered, much less corralled, such advanced technology, a sort of robotic, triangular blue parasite that adapts to and integrates with its host. It’s almost as if the organism itself can think and actively adapt. It’s almost as if it has been lying there, in wait and under cover, evolving, for untold centuries. The only thing everyone can agree on is that this, it – whatever it is – must be stopped and the public must never know. The symptoms, escalating paranoia tied with nearly inhuman violence followed by the murder, the mutilation, the odd planning, and the strange dissolution of the infected would drive the public into mass hysteria. Especially if they know that the government thinks this is no accidental sickness but a planned, clever, highly engineered attack that’s just beginning. Meanwhile, Perry Dawsey, an ex-football star with an anger problem, some daddy issues, and a dead-end job is starting to feel unwell and there are strange triangular growths on his body. 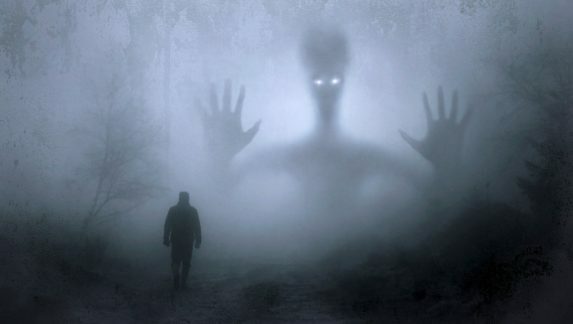 No Dawsey, however, is such a weakling as to go to a doctor, to be taken down by a temporary sickness, even when the voices start, even when the alien eyes begin opening. Siegler’s gory sci-drama is half horror and half something else – some strange morph between a pseudo, light medical drama and a splatterpunk debut. The main protagonist, Perry, is trying to get his life together, despite the ghosts of an abusive past; it is through him that our knowledge, from the prologue and from the busy government operatives who buzz unsteadily in their own tense chapters, manifests fully. We watch Perry as the triangles take over, as the fear wars with a self-preserving albeit unnatural sense of anger. And through Perry, neither sympathetic nor truly hateful, the book’s true purpose evolves – to thoroughly revolt readers. In this, Infected succeeds. Not a newbie to hor ror, I spent most of my teenage years reading progressively gorier stories, finally spending several years lost to Ed Lee’s perverse dramas that classify as splatterpunk – something beyond horror and known for its graphic content. I figured that Infected would be tame in comparison and although I’ve softened in my horror predilections, preferring creature features and spooky backdrops to depictions of depravity (aging and realization of mortality do that to you), I usually can still read my way through an unsettling tale without losing my supper. Not so here. That is part of the book’s talent and part of its downfall. It’s all about the shock value. We have Perry clawing into his own body, whether with his bare nails, his chicken scissors, a fork…. you get it. Obsessed with getting the rooted invaders removed, he transcends the pain, as only a Dawsey could, and in so doing covers many blood trailed pages with in-depth descriptions of self-mutilation. These scenarios keep coming, faster and longer, as the book progresses. The true gist of the story then is not about the pathogen but about the fight of one man against his own physical body. This then is one of the few, if not the only, books that has ever left me shivering and feeling faint at the end of most chapters. On a side note, I suspect a living human, even a half crazy one, could not take such self-inflicted brutality, could not continue walking and moving and functioning after doing so much damage. The entities themselves, for that is what the parasitic triangles are, are well thought out, fascinating even; it is this that keeps the reader invested after all the pages of a seemingly pointless blood bath. Yet the conclusion destroys the subtly of the triangle’s existence and takes a truly spooky concept and turns it into just another B-movie invasion scenario – one that rapidly escalates into something dramatically visual and chaotic, when most of the book was mere hints and side glimpses of the entities embryonic state. After so much time spent in Dawsey’s dark apartment, watching him shred and stab his own flesh, the sudden escalation and rapid-fire last-minute movement destroys the foundations with information, too quickly and inexplicably thrown into the mix. The conclusion then pulls the ultimate in dissatisfaction – a set up for a sequel and no attempt to truly end the narrative we’ve been grimacing through. 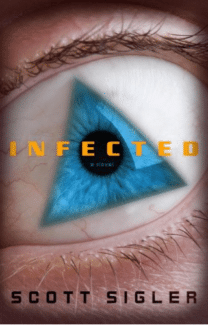 Infected was interesting, at times even edge of the seat, but ultimately a book that shocks for the sake of shocking without developing the underlying strength of an idea that while unique is underdeveloped and eventually caves to the pressures of formulaic sci-fi writing.